Ruaidhri Higgins says he is determined to prove a point after failing to win a new contract with Derry City. 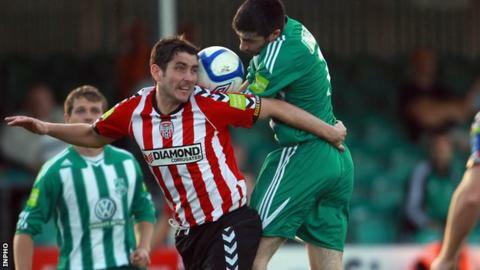 The former Bohemians midfielder has had two spells with Derry but has been told he does not feature in the plans of new Brandywell boss Roddy Collins. Limavady man Higgins, 29, would appear to be surplus to requirements following Derry's signing of former Sligo Rovers skipper Danny Ventre. City have also let striker David McDaid depart for Irish League club Coleraine. "Roddy has taken over and he wants to make a stamp and he wants his own players in and I have to respect that," a disappointed Higgins told the Londonderry Sentinel. "I can understand a manager wanting to put his own mark on things. "Now I have to look onwards and upwards, and it has actually made me hungry to go and prove a point. "I am a footballer and that is what happens in football. You never know what is around the corner and now I have to meet the challenge head on."